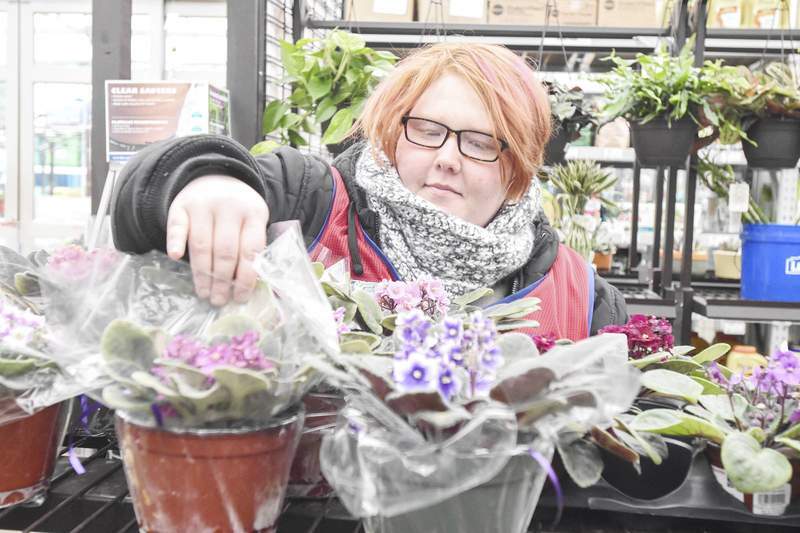 Michelle Davies | The Journal Gazette Shelby Mealer used assistance from Easterseals Arc of Northeast Indiana to get a job in the gardening department of Lowe's. 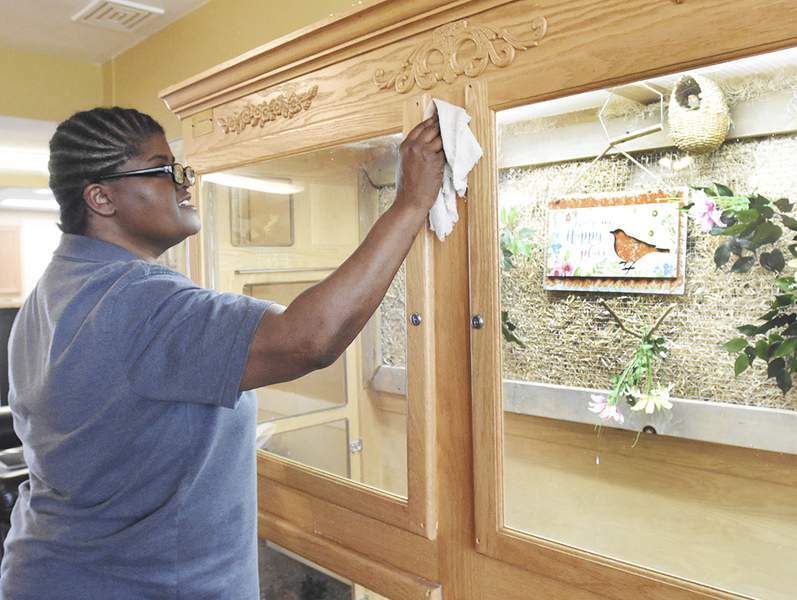 Cathie Rowand | The Journal Gazette Lisa Dobynes, who got her job as a housekeeper with help from Easterseals Arc. 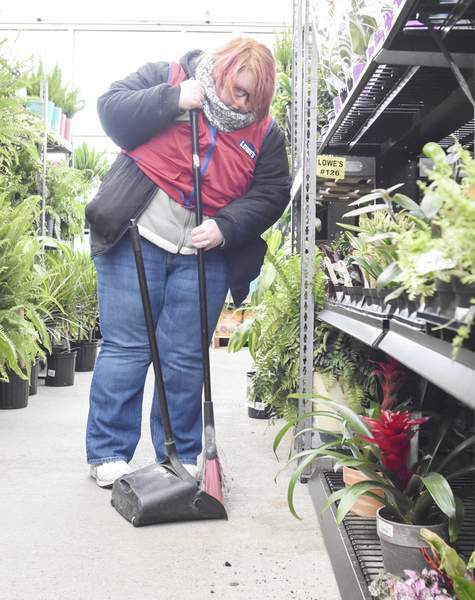 Michelle Davies | The Journal Gazette Shelby Mealer, an employee at Lowe's Home Improvement, in the gardening department, who obtained her job with help from Easterseals Arc. Cathie Rowand | The Journal Gazette Lisa Dobynes, who got her job as a housekeeper with help from Easterseals Arc, cleans at Miller's Merry Manor, 5544 E. State Blvd. Like any other students, they have goals and aspirations. They play sports and attend dances. But special education students face special challenges. Today is the final story in a Journal Gazette series that began April 22 focusing on these students. When unemployment is low, most workers feel reasonably sure they can land another job if they don't like the one they have. But it's not that easy for some. People with physical, mental and other disabilities often get shut out of the workforce. Only 36 percent of the 20.8 million work-age Americans with identified disabilities were employed in 2016, according to data from the Institute on Disability at the University of New Hampshire. Indiana matched the U.S. rate, placing it 27th of the 50 states. In a region where unemployment is below 4 percent, it doesn't make economic sense to leave so many capable people on the sidelines, some disability advocates say. Others feel a deeper calling. They say hiring people with disabilities is a moral issue. RespectAbility, a nonprofit that advocates for equality, equity and inclusion, paints the problem in stark terms on its website. “Ableism is a real thing just like racism, sexism and other isms,” the organization states. The ratio of people who fall into that category, RespectAbility says, is 1 in 5. Various local nonprofits, including Goodwill Industries and Scherer Resources, work with clients with disabilities, preparing them for the workforce and placing them in positions that fit their skills. 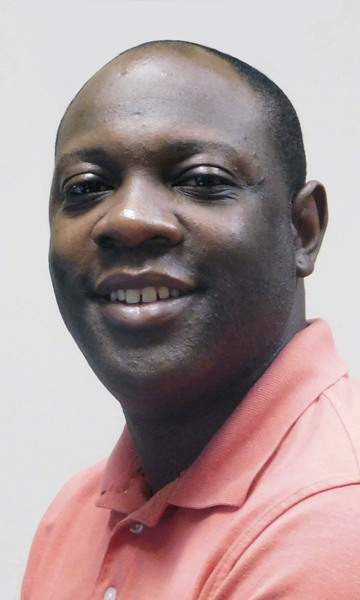 “If you want to work, we'll find a job for you,” said Thomas Summerville, Easterseals Arc of Northeast Indiana's vice president of employment and community supports. The local Easterseals Arc, which serves more than 800 clients, connects employers with people with disabilities who need and want jobs. Lisa Dobynes and Shelby Mealer are Easterseals Arc clients. Both are in their first paying jobs. Dobynes, 47, has been a housekeeper at Miller's Merry Manor for two months. Her duties include vacuuming, mopping, dusting and emptying wastebaskets. “I just love people to death. And I've got a special heart for the older folks,” she said. Dobynes, who stumbled over spelling her last name, works two mornings a week about 14 hours total. Making eye contact doesn't come naturally. And she welcomes the help when an Easterseals Arc staff member offers to explain some details of her life. Even so, Dobynes is well-suited to succeed on the job. Some disabilities are easier to spot than others. Mealer, 26, doesn't display any obvious limitations but qualifies for a group home arranged by Easterseals Arc because she has an intellectual or development disability and has a Medicaid waiver for services. 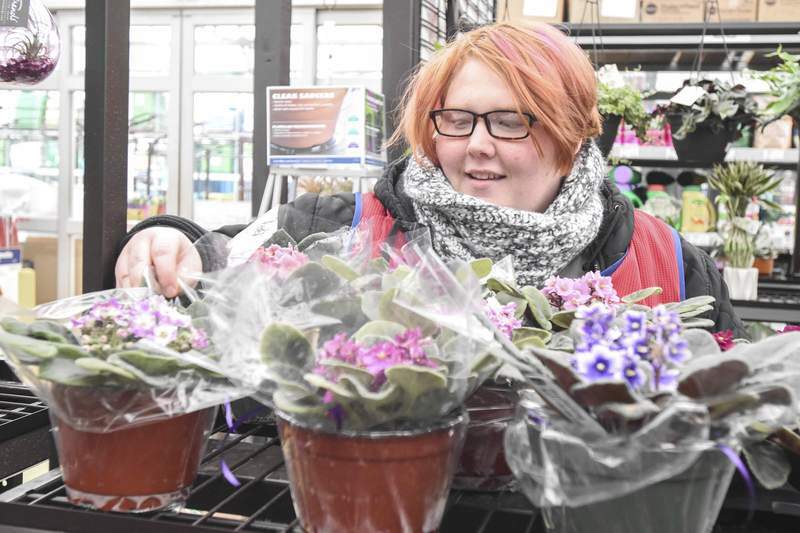 She works in the gardening department at Lowe's, organizing new shipments of flowers and answering customers' questions. Before getting hired, she had no experience with plants. “I just really want to learn about it,” she said. Before either woman was hired, Easterseals Arc staff worked with their employers to identify necessary skills to do the work and talked with clients to determine who was ready to fill the positions. Easterseals Arc isn't a passive matchmaking service. The nonprofit helps people with disabilities develop new skills they need to succeed in the workplace. Dobynes and Mealer completed Easterseals Arc's Employment Readiness Academy, created in partnership with Lutheran Hospital. Clients go through an 18-week program of three six-week rotations in departments including food service, housekeeping, shipping and receiving, mail room and gift shop. Training addresses hard skills and soft skills. Hard skills include negotiating a cart with dinner trays onto an elevator and delivering meals to the correct rooms. Soft skills include making eye contact and small talk with customers and remaining calm in frustrating situations. Summerville, said the program leads to 58 percent job placement for graduates. 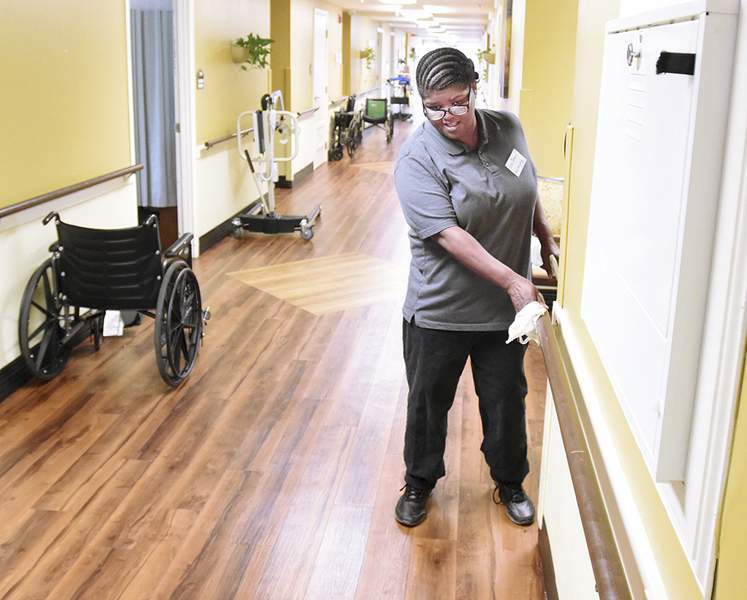 Some get jobs at Lutheran Hospital, but they also find jobs at other local workplaces. It can take a couple of weeks to more than a year to prepare a client for outside work, Summerville said. Some people just need help with a résumé, he said. Others have many more barriers, including paralysis or other physical limitations. None of that disqualifies someone from finding paid work. Even someone unable to move his arms and legs can potentially meet the requirements for a call center position or as a greeter in a big-box store, for example. Chris Gomez, Kroger's regional manager, said the grocery chain doesn't make assumptions about what job applicants can do. Gomez said inclusion and diversity are two of the company's six core values. Kroger encourages organizations serving people with disabilities to bring their clients to the retailer's hiring fairs. The expos, also called transition fairs, allow special ed students to meet with employers and learn about available jobs. “Transition” is a word that gets used a lot at AWS Foundation, which awarded $3.2 million in grants last year to organizations that serve people with disabilities. Among those are grants to schools that want to launch vocational training for special education students. Patti Hays, the nonprofit's CEO, said her organization wants to help students transition from the classroom to the labor market. The idea that the people with physical and developmental disabilities can function well in the workplace is fairly new, she said. “There's that tyranny of low expectations,” Hays added. AWS Foundation recently approved support for a new local initiative designed to increase employment opportunities for people with disabilities. Greater Fort Wayne Inc., a nonprofit that bills itself as the “single point of contact for economic growth in Allen County,” requested funds to underwrite a new staff position. The three-year grant totals $245,000. The new disability employment services coordinator started work last week. Many Allen County employers rely on Greater Fort Wayne for help with business issues, including finding workers in a tight employment market, Hays said. “To have a staff member who can talk with employers about hiring those with disabilities and to answer their questions and help guide the process was a great idea,” she added. Chuck Surack, founder of Sweetwater Sound, and Kathy Callen, community engagement executive at Old National Bank, championed the position. They worked with Eric Doden, Greater Fort Wayne's CEO, to create the vision, according to Cheri Becker, who wrote the grant application. Old National is among employers that embrace the contributions of people with physical disabilities. The Evansville-based financial services provider has numerous success stories, including a teller who doesn't have legs. Ron Hagy, Old National's senior vice president and talent acquisition manager, said making a successful match is more than finding out what a person can do. It involves finding out what interests the job applicant. 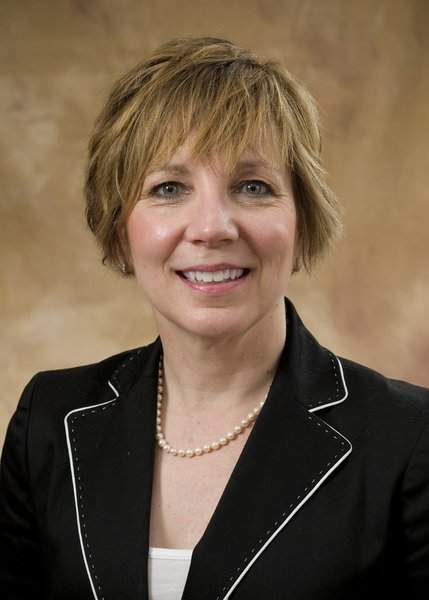 Kathy Schoettlin, a spokeswoman for Old National, said the bank has hired people with physical disabilities to work in marketing, operations, wealth management and public relations in addition to teller positions. An accountant for the company relies on a device that straps around her forehead to use the keyboard because cerebral palsy has limited her ability to use her arms and hands. In Old National's call center, a man in a wheelchair answers account holders' questions. “The customers, of course, have no idea,” Hagy said. People with disabilities have numerous champions in the region. High schools and colleges are among those offering job skills training for people with disabilities. Northeast Indiana Works encourages employers to consider hiring people with disabilities, especially as the availability of talent from more traditional sources wanes, said Rick Farrant, Northeast Indiana Works' spokesman. Northeast Indiana Works operates 11 WorkOne Northeast career centers, where it helps individuals train for new jobs and employers fill open positions. Summerville, of Easterseals Arc, believes employers will keep hiring people with disabilities even after unemployment rates increase. Employers like the supportive partnership that Easterseals Arc offers, Summerville said. Staff accompany clients on their jobs for the first several weeks to make sure the client understands the rules and their responsibilities. Later, if a problem arises with a worker, management can contact Easterseals Arc and ask for help resolving the issue. “It's helping their bottom line because they don't have to keep hiring” and training new people, Summerville said. Farrant believes people with disabilities also contribute to a positive working environment. In an email, he described the individuals as eager to work, loyal and committed to doing a job well. Employers' hiring discussions should always include people with disabilities, Farrant said. Hays, of AWS Foundation, agreed. 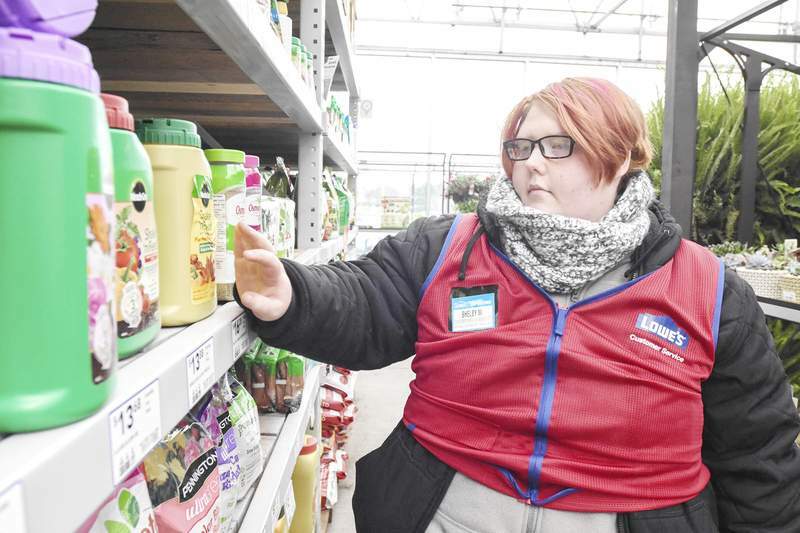 “It's not uncommon that you find the individual with a disability is a loyal and dependable and hardworking employee,” she said. 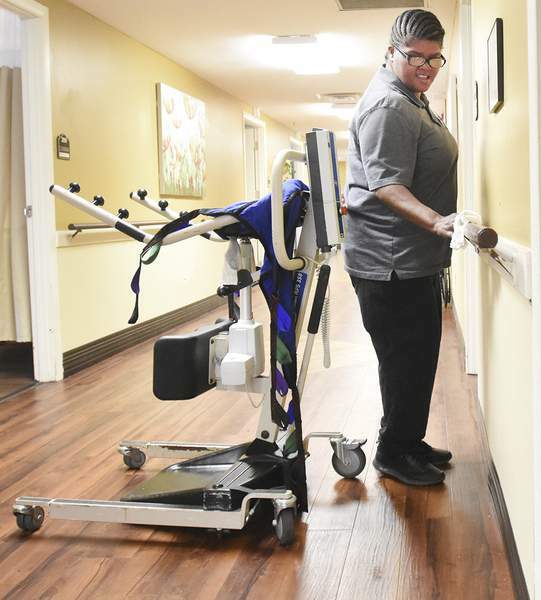 People with disabilities are typically grateful for the opportunity to work, advocates say. Last month, Dobynes, the Miller's Merry Manor housekeeper, was preparing to go shopping with her first real paycheck. She planned to buy new clothes with some of the money and save the rest.